NW1 Dental Care are pleased to offer our patients All-on-4 or Same day implants treatment in Camden, North London. What is Same day Implant, All on 4, All on 6, Same Day Smile and Teeth Now? This is a very popular treatment designed to replace multiple missing teeth on same day !! It is a treatment that replaces a whole arch or both arches of missing or failing teeth with a fixed bridge attached to dental implants in one visit. So if you need to replace all teeth in an arch and everything done in same day, saving time and money then at NW1 dental care we can offer Same day dental implants treatment. 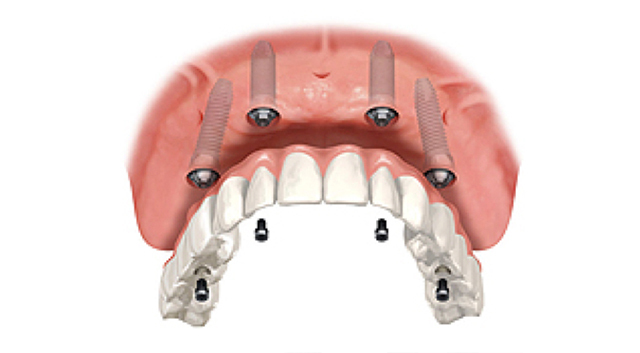 It is a revolutionary treatment which allows a complete set of teeth(arch) to be supported by just 4-6 implants. 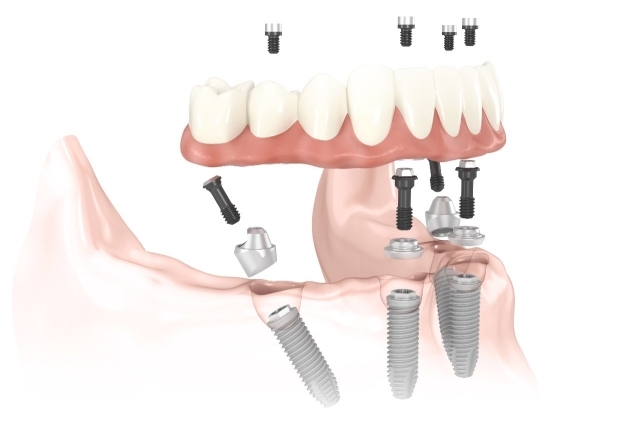 The dental implants are positioned in such as way so as to maximize the existing jaw bone structure and then these four dental implants are attached to permanent teeth replacements.This treatment utilizes both denture and implants and provides an efficient solution to replace full set of missing teeth. The full set of teeth or arch will make a big difference to your daily life in terms of ease of eating, talking and boosting your confidence. At your first stage you will have a consultation with your dentist who will go through the procedure and answer any of your questions.Then he will examine your case, take X-ray and possibly CT scan to diagnose if this treatment is suitable for you. If you are an successful applicant then we will arrange to fit the implants like normal implant process. During this time we will remove any damaged teeth remaining before we place the implants in jaw bone. The treatment is carried out under anaesthesia and is pain-free. It involves positioning implants at at specific angles, with the back two implants placed at a 45 degree angle & the front implants positioned at a 90 degree angle. The placement of the implants is designed to provide better support and anchorage and facilitate the healing process. Once implants are precisely positioned we will fit the new teeth – which would be ready to show off straight away. Also, your teeth are custom made so as to blend with your face and bone structure so as to look natural and real. After the treatment we will explain how to take care of your new implants. We will schedule some follow up sessions to see how you getting on and if any changes or adjustments are required so that you happy with your end result. Am I suitable for Same day teeth ? How are these different to normal implants ? Who can benefit from this treatment ? This treatment is very popular and used by many as it provides fixed long term solution and cost less in long run compared to other available options. Is it cost effective and affordable ? Same Day implants can solve complex and cases which were thought to be untreatable. They are affordable, long lasting and more cost effective solution which save you both time and money. It requires less implants per arch, less dental visits and less surgery time. At NW1 Dental care we offer a range of financial options to help you gain back your amazing smile.